This skills program is an overview of some of the ways you can call for help from the wilderness. Have you ever thought about how you'd get help if you needed it? Out of all the different ways you could let somebody know about your situation, some of them work better than others. This is an updated version of our program number 37 of April 13, 2006. Steve talks to Bill Jeffrey about amateur (or "ham") radio. Bill created and maintains a web site called the Pacific Crest Trail Repeater Guide. 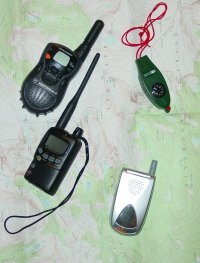 Amateur radio is still the primary choice for most volunteer search and rescue organizations. We also hear about Personal Locator Beacons (PLBs) from Doug Ritter, a survival skills consultant and journalist who operates the Equipped to Survive Foundation. Laurel Boyers, who recently retired as Yosemite National Park's wilderness manager, talks about how easy access to rescue services makes the wilderness less wild. Finally, we hear from Tim Kovacks of the Mountain Rescue Association.